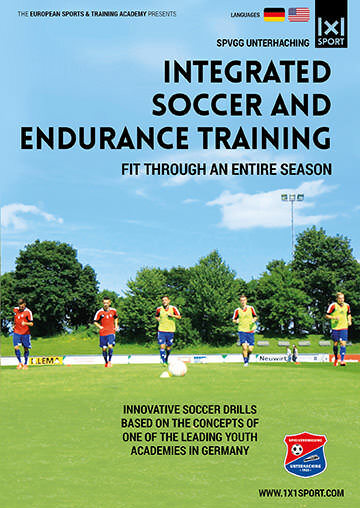 Okay, everybody knows that endurance training is not very popular among most soccer players, yet it’s necessary in order to maximize the potential each player has in terms of stamina and endurance. We show you how to update your endurance training program using the HIIT-method. Trust me, you will never train for endurance in any other way, and your players will reap the benefits! This drill starts off with the players dribbling a ball towards a hurdle that they have jump over. After controlling the ball they have to dribble through a set of training poles, jump over one more final hurdle, all while trying to reach the finishing cone within ten seconds. Since two groups start simultaneously across from each other, the two players are likely to meet while they go through the set of poles. In order to do justice to each player’s level of endurance, it’s recommendable to divide the player’s into different groups. Each group has to complete varying distances in order to ensure that each player gets the ideal amount of training he needs to improve.